Modern and wooden two-floor Tent, ideal for one big family or more than one, for a maximum of 6 people. Ideal also for group of friends. Equipped with 6 sleeping places, at the upper-level. 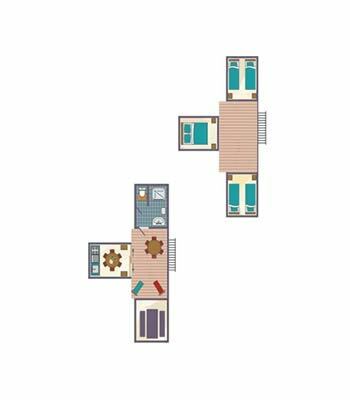 Interior equipment: at the bottom floor there is the kitchen corner with dishes and table, toilette with shower and small garden; at the upper- level there are the 3 double bedrooms (one with a kingsize bed and two with 2 separated beds)and a small uncovered terrace with beach umbrella, table and chairs, accessible with a wooden external steep staircase. Parking place. Animals are NOT allowed.